The Go-Ahead Group plc has announced its trading update for the period from 31 December 2017 to 23 May 2018. The next scheduled market update is the Group's full year results for the year ending 30 June 2018 which will be released on 6 September 2018. The year to date growth rates shown in this statement are for the period from 2 July 2017 to 28 April 2018. "In a challenging market environment with reduced retail footfall and pressures on local authority budgets, our businesses have performed well overall. "In bus, our London operations have seen an improvement in service performance resulting in higher Quality Incentive Contract income. Revenue and passenger trends remain mixed across our regional bus businesses. "In rail, trading has been good in the period, largely due to efficiency improvements and helped by the resumption of full Southeastern services through London Bridge station. In partnership with the industry, this week we began the introduction of the largest timetable change in decades. The modernisation of the network will lead to new routes, greater connectivity and increased peak frequency through central London with the new technology of automatic train operation. "As part of our strategy to develop for the future of transport, we announced the UK's largest demand responsive trial of high-quality minibuses in Oxford - called 'Pick Me Up' - which will begin operating next month. Passengers will use an app to route journeys according to their needs. We are also working with logistics partners including a pilot at our Crawley depot to manage deliveries in the area. "The Board is confident the Group will deliver full year results that are slightly ahead of its previous expectations." * Revenue and passenger journey growth rates exclude the impact of a programme of route restructuring (estimated at -0.5%). This principally reflects reductions to the route network in East Anglia. 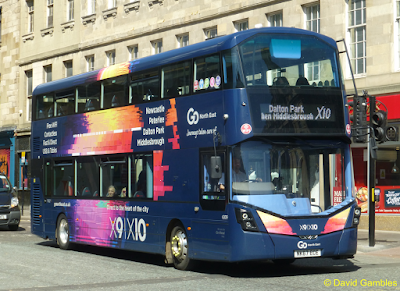 Revenue and passenger journey growth trends in regional bus remain subject to challenging market conditions with the adverse weather dampening growth rates since the half-year. Across the division growth continues in some regions and regional bus profit for the second half of the year is expected to be close to last year's level. The customer-centric approach resulted in Go-Ahead achieving the highest-ever passenger satisfaction score from Transport Focus (91%), including achieving the highest scores for punctuality and journey time. *Includes Singapore bus for the period from January in both years. ** Peak vehicle requirement is the number of vehicles required to operate the highest service frequency on a route. This measure provides a useful indication of the volume of contract work being operated from one year to the next. In London bus, mileage was flat and peak vehicle requirement was down as expected. Continued improvements in operational performance resulted in strong Quality Incentive Contract income and was recognised by Go-Ahead winning Bus Operator of the Year at the London Transport Awards. The timing of some contract losses means that full year mileage is likely to be down by up to one per cent. Strong financial discipline in bidding against a backdrop of budget pressure for Transport for London with anticipated medium-term impacts on PVR and mileage. Looking ahead, fewer contracts are coming up for renewal over the next two financial years. Therefore significantly lower levels of capital expenditure are expected giving corresponding increases in free cash flow in those years. The bus operation in Singapore, reported within the London bus division, continues to perform well, delivering high levels of punctuality on behalf of the Land Transport Authority. The second half of the year is expected to deliver operating profitability at London bus that is comparable to the first half, representing an improvement on previous expectations. The rail division operates the Southeastern and GTR franchises through our 65% owned subsidiary Govia. Underlying passenger journeys and revenue growth have improved since the half year, having recovered well from a reduction in journeys during the Christmas period. This was boosted by the resumption of full services through London Bridge station, after three years of partial closure. Continued good progress in the delivery of the efficiency programme has led to an increase in our profit expectations for the year. During the period, the DfT confirmed a 12-week extension to the current Southeastern franchise to 1 April 2019. Customer satisfaction and reliability has steadily improved over the past four years and the company will continue to focus on delivering the best possible service for passengers through the extension period. Govia has been shortlisted for the next South Eastern franchise to be awarded by the DfT in the Autumn. Go Ahead continue to deliver improvements on GTR with higher passenger satisfaction levels on Thameslink service than at any point since 1999, according to the latest National Rail Passenger Satisfaction (NRPS) survey which showed an 83% overall satisfaction rate, an increase of 10% over the previous year. New trains, more punctual services, better information and more helpful staff have helped to improve results according to the independent national passenger watchdog Transport Focus. Better punctuality on Southern has also seen passenger satisfaction climb by 7% over the previous year to 72%. The introduction earlier this week of the largest timetable change in decades boosts capacity for our passengers with almost 400 more trains running every day and space into London for an extra 50,000 passengers in the morning peak. Discussions with the DfT regarding a number of contractual variations are ongoing. The Group was made preferred bidder for a second bus tender in Dublin by Ireland's National Transport Authority. This will bring the total number of routes operated by Go-Ahead in the Irish capital to 30. The contract will run for five years from early 2019 with a possible two-year extension. The mobilisation of existing Dublin bus contract and German rail contracts continue to progress ahead of their respective 2018 and 2019 start dates. Meanwhile, the group development team continues to pursue value adding opportunities in current and new international markets, where there is a strong pipeline of bid opportunities in both bus and rail.